At Saastr, Jason and I discussed the role of private equity in SaaS on stage as a potential acquisition path for SaaS startups. 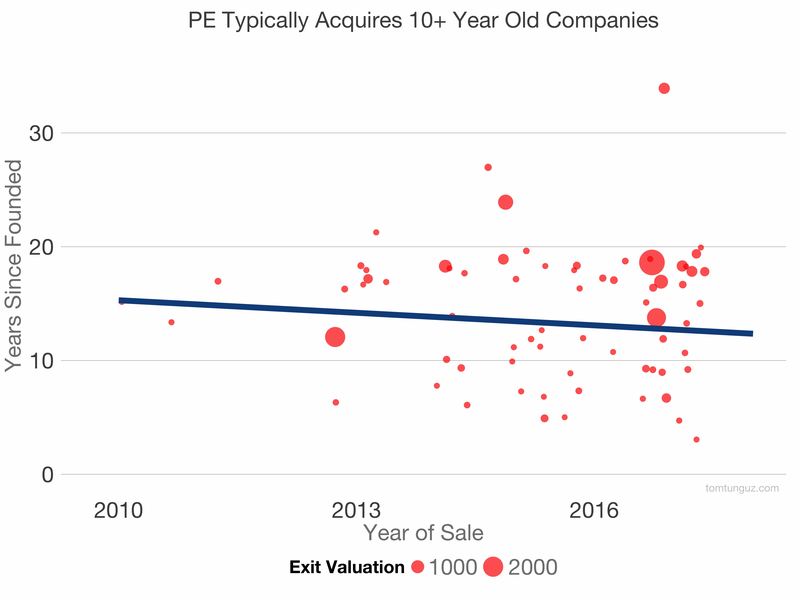 Private equity hasn’t been a common exit route for venture backed startups in the past. But that’s changing. 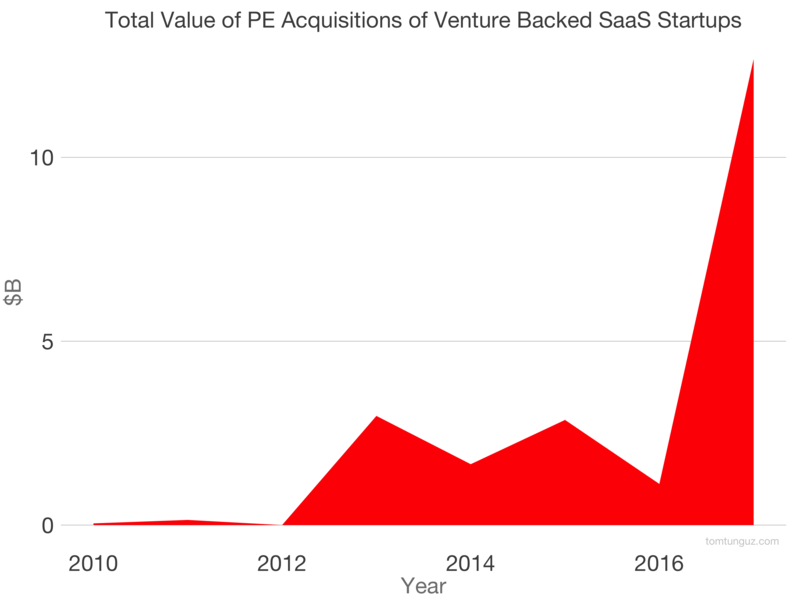 The chart above depicts the total disclosed value of US venture-backed SaaS startups which have been acquired by PE firms since 2010. The aggregate value has grown from zero to about $13B over that time period. That’s roughly equal to the \$14B spent by corporate strategics in the same market. Said another way, PE firms are spending as much buying SaaS startups as corporate acquirers. What’s changed? There’s a surfeit of capital in private equity. The excess increases prices and valuation multiples for acquisition targets. The result? PE firms pay the same or greater multiples than corporate acquirers, which hasn’t been the case in the past. Deal sizes have increased as well. 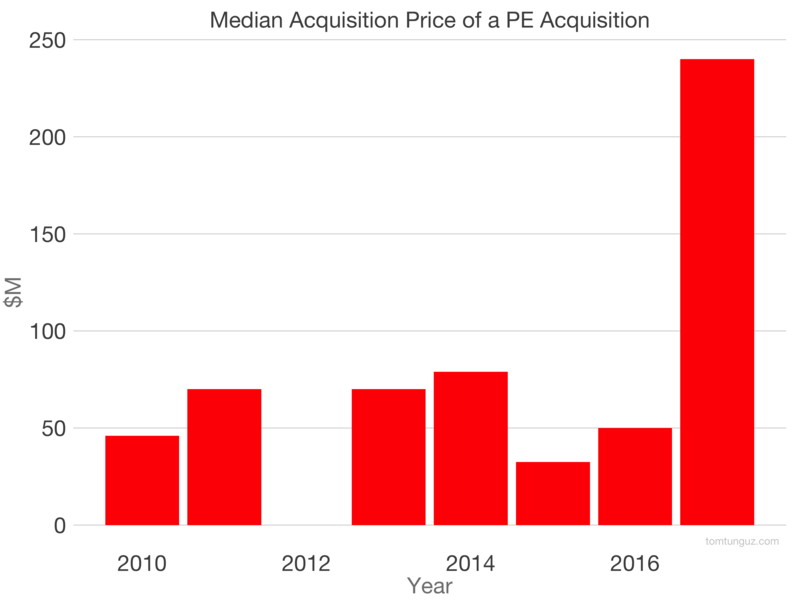 The median venture-backed SaaS acquisition by PE has increased to $250M, up from \$50M in 2010. The average deal size was \$470M in 2017. Second, SaaS companies are aging. As they ripen, these companies have established themselves in a market, developed the predictable revenue and growth patterns (and potentially positive net income) sought by private equity firms. They generate stable annuities that can be levered with debt, and then managed to reduce costs - which is an ideal target for the standard LBO playbook. In addition, competition in the PE market is pushing private equity buyers earlier, as the chart above shows. Private equity will remain a potential exit option for SaaS startups who fit the mold. Predictable revenue streams, potential for cost cutting, and able to be levered. 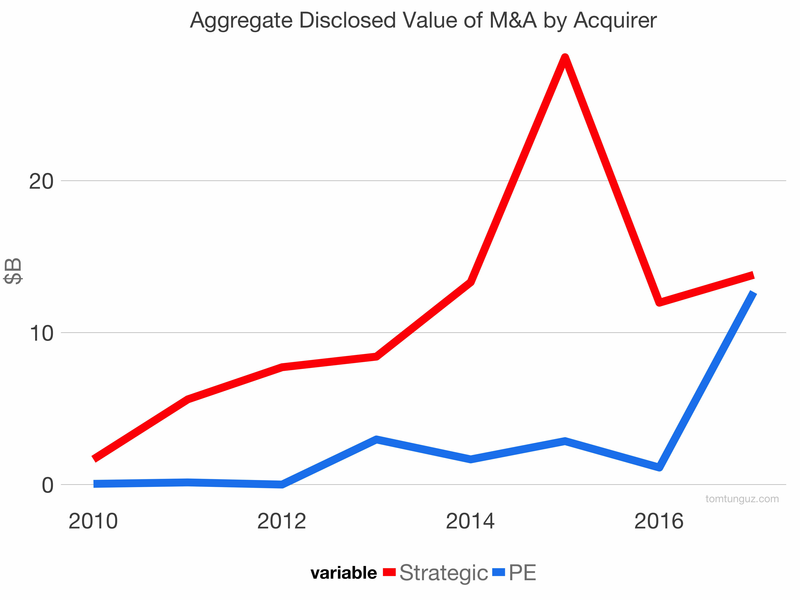 As the data above shows, about PE has rapidly become a substantial player in SaaS consolidation, and should remain so for a long time.